NOW 600mg! 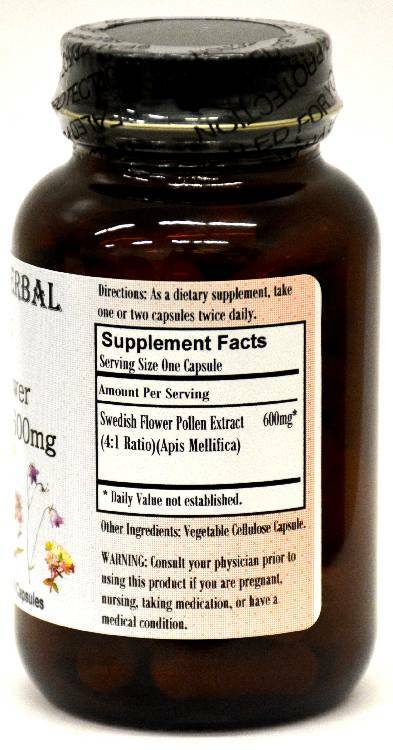 Barlowe's Herbal Elixirs is pleased to offer a very high quality, 4:1 Swedish Flower Pollen Extract. Swedish Flower Pollen promotes healthy urine flow and helps maintain normal prostate cell function, and is widely used in Europe and Asia for this purpose. Bottled in Glass! No Stearates! No Fillers! No Junk! NOW 600mg! 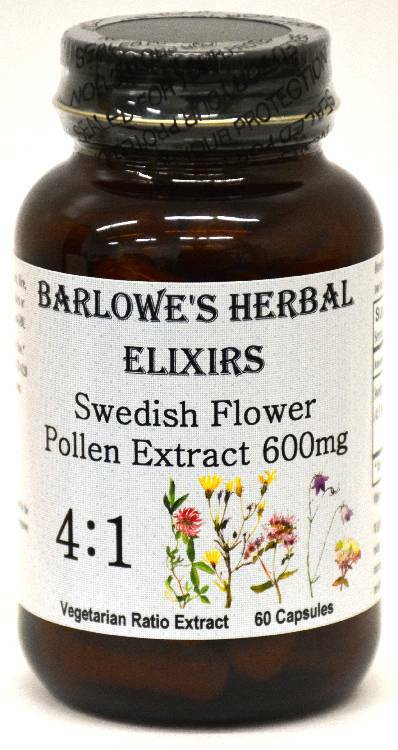 Barlowe's Herbal Elixirs is pleased to offer a very high quality, 4:1 Swedish Flower Pollen Extract. Swedish Flower Pollen promotes healthy urine flow and helps maintain normal prostate cell function, and is widely used in Europe and Asia for this purpose. This product is extracted Bee Pollen, collected from wild flower and buckwheat fields in Sweden by honey bees and then extracted on a 4:1 basis to remove all moisture. This yields a product which is very bio-available. Other types of flower pollen have to be treated with solvents to break down the pollen walls in order for them to be digested. Barlowe's product is chemical and solvent free. 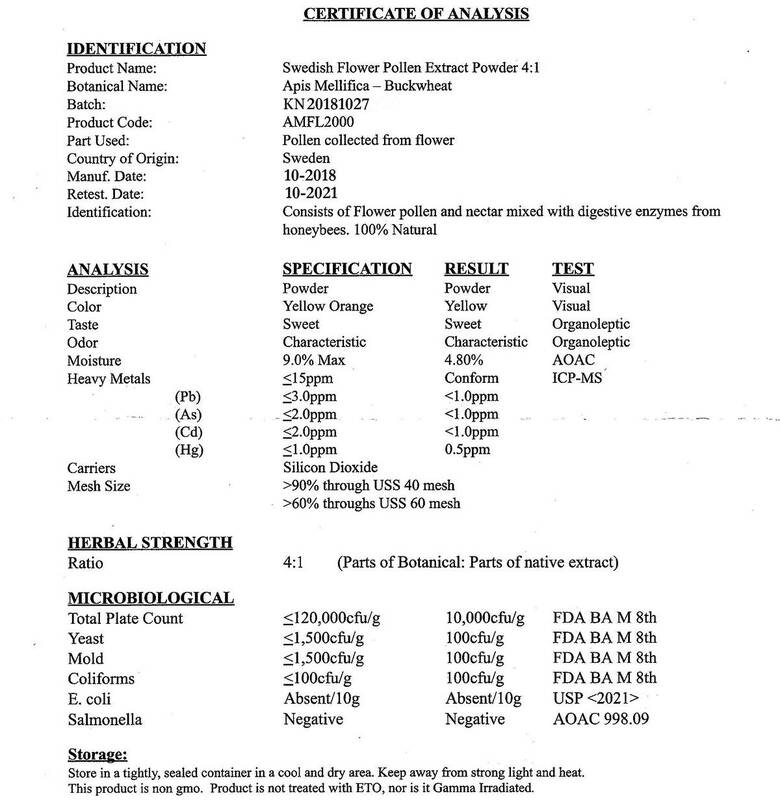 The Swedish Flower Pollen Certificate of Analysis (COA) for this particular batch is shown above. Bottled in Glass! No Stearates! No Fillers! No Junk! Treatment of Outflow Tract Obstruction Due to Benign Prostatic Hyperplasia with the Pollen Extract, Cernilton, British Journal of Urology, 66:398-404, 1990; Becker, H., and Ebeling, L., Conservative Treatment of Benign Prostatic Hyperplasia (BPH) with Cernilton-N, Urologe, B 28: 301-6, 1988. Symptom improvement was most striking for prolonged difficulty in urination, nighttime urination, and reduced urine flow. As men age, the prostate gland oftentimes increases in size. Enlargement of the gland is called benign hyperplasia (BHP), and usually results in restricted urinary flow. As long ago as 1960, E. Ask-Upmark, a Swedish researcher, reported that Swedish Flower Pollen was effective in treating prostatitis - an inflammation of the prostate. It has been theorized that this pollen works by increasing the natural production of interferon, a protein produced by cells as a defense against viruses, and that it reduces the swelling and irritation of the urethral mucosal surface and bladder neck - improving urination with no side effects. Furthermore, animal studies have shown that Swedish Flower Pollen has anti-oxidant properties and helps to strengthen the immune system. It has been found to protect the liver in animals exposed to liver toxins and to help maintain healthy liver function. Flower pollens reduce the negative effects of naturally occurring androgens that weaken the hair follicles. It is speculated that pollen extracts inhibit the formation of dihydrotestosterone or DHT, the hormone responsible for genetic hair loss, either by blocking the contributing enzyme (5-alpha-reductase), or by blocking the binding of DHT to the receptor. Though it is not definite, the tentative conclusion is that Swedish Flower Pollen Extract inhibits the binding of DHT to the receptor. Caution: Barlowe's Swedish Flower Pollen Extract is generally safe, but it is potent and should be utilized with care. In rare instances, pollen products may cause allergic reactions. DO NOT TAKE if you are allegic to bee products. This product is for dietary use. If side-effects occur, discontinue use immediately! The above statements have not been evaluated by the Food and Drug Administration (FDA). This product is not intended to diagnose, treat, cure, or prevent any disease. Directions For Use: Take two capsules either once or twice a day without food; if once a day take an hour before bedtime for best results. Results and usage amounts may vary based on body type and weight.